Blizzard's Seoul office was raided as part of an ongoing investigation into consumer complaints about Diablo 3. Blizzard's been taking a lot of guffola over Diablo 3, but nowhere is the ride rougher than in South Korea, where an investigation into possible violations of the country's electronic commerce and commercial contracts laws is being carried out by the country's Fair Trade Commission. The FTC actually raided Blizzard's offices earlier this week, seizing documents and other evidence as it seeks to determine whether or not any laws have been broken. The matter relates to Blizzard's refusal to issue refunds to disgruntled Korean gamers, hundreds of whom have filed official complaints with the FTC about overloaded and inaccessible Diablo 3 servers. Many of them have demanded their money back but Blizzard, citing EULA terms, has refused to do so; instead, it doubled its server capacity in the region and said it would continue to take steps to improve the service and avoid service problems in the future. But for a lot of players, that's not good enough. "We have received many complaints from Diablo 3 users," FTC rep Kim Hyung-bae said, although he refused to elaborate. Other officials, however, said the investigation is looking into allegations that the game was sold based on an "unfair" contract and whether Blizzard was "ill-prepared" for the high traffic at launch. 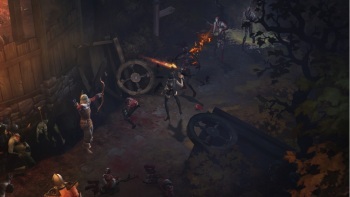 There's no word on when the investigation will conclude, but the expectation is that Blizzard will be ordered to issue refunds to all unhappy Diablo 3 owners in the country. Despite its well-publicized troubles, Diablo 3 has been a huge, albeit entirely unsurprising, success for Blizzard, selling 6.3 million copies in its first week of release.